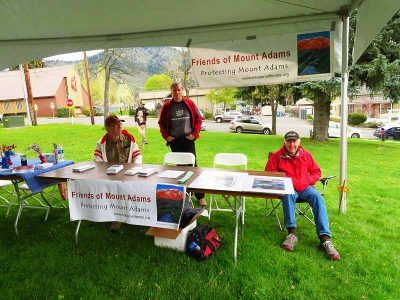 On April 22, 2017, Friends of Mt Adams had a table and joined in a march in White Salmon, WA, for the nationwide March for Science events to protest policies that do not follow rigorous science. The glaciers on Mt Adams in particular have suffered a serious loss in area and volume in the last century and board member Darryl Lloyd had prints showing before and after photos on Mt Adams and Mt Hood from now and the early 1900s. Board member Laurie Wilhite spoke to the crowd about scientific awareness and a number of board members sat at the table to describe FOMA to attendees. 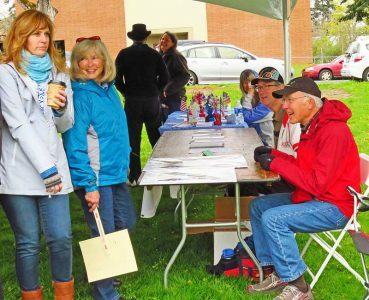 We also carried one of our banners on the permitted march on a loop in downtown White Salmon. This entry was posted in news and tagged global warming. Bookmark the permalink.